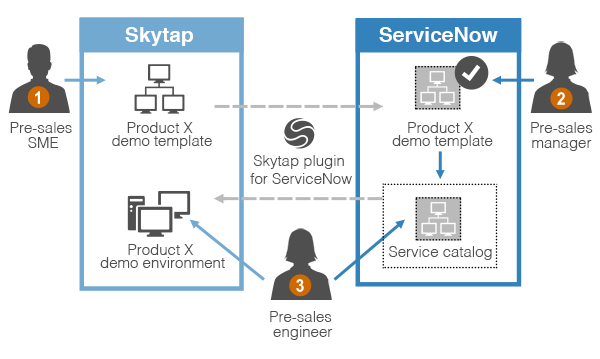 The Skytap plugin for ServiceNow supports a basic workflow for adding Skytap templates to the ServiceNow service catalog and provisioning requested environments on demand. In Skytap, a pre-sales SME prepares a golden template of the demo environment. In ServiceNow, a pre-sales manager uses the plugin to locate the template. The pre-sales manager approves the template, and adds it to a ServiceNow service catalog. Skytap automatically provisions the environment and displays an access link in ServiceNow. The pre-sales engineer logs into Skytap to access the environment and use it for the sales demo. When the environment expires based on the defined schedule, Skytap automatically deletes the environment. The Skytap plugin for ServiceNow uses the Skytap REST API to request information and create environments from templates. To get started, install the Skytap plugin in your ServiceNow instance.